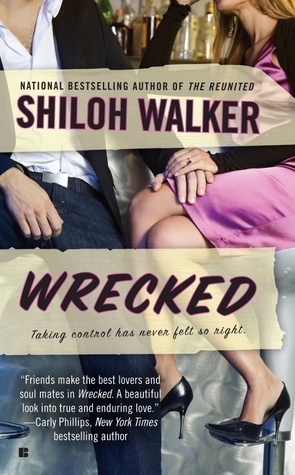 Shiloh Walker’s Wreck of a Blog Tour + Prizes + Fun! WRECK OF A BLOG TOUR! and l answer them too! Q:: Do you have a tattoo? Shiloh A: Yep…it’s a feather quill on the back of my right shoulder. Quills…writers. Made sense to me. Me A: Nope. I admire them but I’m rather a chicken. Shiloh A:I bought one…it inspired the idea behind WRECKED. Shiloh A: I played with the WRECK journal, and still have it sitting on my shelf. Did a few ideas inside it while I was writing the book, but I’m not much of a journaler. I do most of my writing in my books and my blog. Shiloh A: Mostly Zach…I let life happen, but I do tend to try and control stuff. I can’t plan worth crap, though and organization evades me. That would drive Abby nuts. Answer the Qs and play along! Win a date with me & my laptop…or a copy of WRECK THIS JOURNAL. With her Hollywood dreams long gone, Abigale now has a nice, neat, uncomplicated life–until the day her perfect fiancé needs to talk. Dumped, a little more than shattered, and totally confused, Abigale turns to Zach, her best friend since forever, to help her pick up the pieces. He does it with a gift–a copy of Wreck This Journal. She can vent her frustrations, and sketch out a new plan. Zach just hopes he’s part of it. Because he’s been in love with Abigale his entire life. If the winner isn’t able to attend either function, I’ll send you a GC for the cost of two drinks (approximate value is probably about $30 ~going by RT drink prices ~to BN or Amazon). shoot! I’m working on it 🙁 Click http://www.shilohwalker.com/website/wrecked/wreck-me-pin-me-tweet-me-date-me-win-me/ to enter at Shiloh’s site till I fix the uh-oh! Answer the Qs! One or all of them! Abby- I’m a compulsive planner. Q: How do you feel about friends to lovers romances? Lurve them! A: Abby, I am so bad that the people in my life (friends & family, etc) usually won’t tell me about anything too far in advance so I can’t over think it or over plan it!